This type of dovetail is a dovetail where the male and female parts are made to fit without any means of adjustment. Examples of this type are the dovetails used on microscopes. Since these are usually very small they are much easier to make if the parts are held in a vice. These parts are moved by means of a rack and pinion. Any play is taken up by using very thick grease on the dovetail or the rack is sprung so as to make a tight fit. It is possible to make them by using very small dovetail cutters. In this case the smallest size is limited by the size of the cutter itself. Getting a perfect fit is essentially a matter of making one part a close as possible to the required size. The second part is then made to fit the first part. These smaller dovetails are so small it is not possible to use a gib to make them fit. A dovetail like this does not have a gib but it might well need some means of locking it. This can be done using screws that look as if they are for adjusting a gib. Because they are not acting on a gib a brass pad is needed between the end of the screw and the male part of the dovetail. They do not need locking nuts. Notice the small brass piece on the left. This is a brass pad round with a 60° cut on it to fit the dovetail. It is possible to make even smaller dovetails if the dovetail is split in half and half of a dovetail is cut in each of these pieces. An example of this would be a dovetail to hold a DTI that is fitted with the male part of a dovetail. Each half of this is made separately. Making a dovetail this way there is no practical limit to how big the cutter is. At the same time there is almost no limit to how small the dovetail can be. 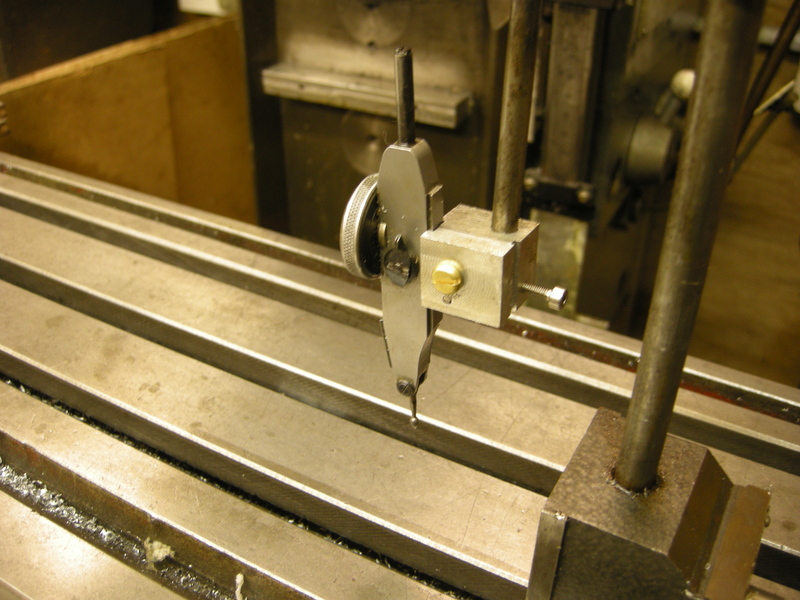 Each part of the dovetail is held in the vice in turn and machined using a dovetail cutter.